Tender U-10 Scallops served with an orange-lemon sauce, fresh orange supremes, sliced jalapeño pepper and minced red bell pepper, garnished with fresh mint. In a small mixing bowl, combine the orange juice, lime juice, lemon juice, olive oil, garlic clove, white onion, honey and sea salt for the orange-lemon sauce. 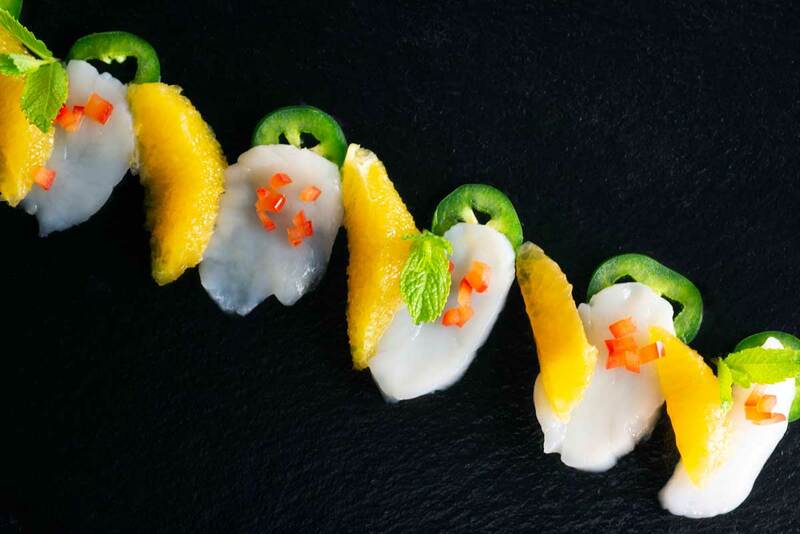 On a plate, separate the U-10 Scallop slices and garnish each with an orange supreme, jalapeño pepper slice, red bell pepper and a mint leaf. Drizzle the sauce over the U-10 Scallops.